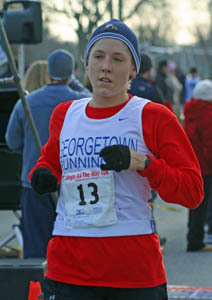 GEORGETOWN RUNNING CLUB: Philadelphia Half Marathon update: Lindsey Jerdonek 17th female (1:26.50)! Philadelphia Half Marathon update: Lindsey Jerdonek 17th female (1:26.50)! LJ is going to beat you to a pulp Wiggy. She hates that photo. Why did you send me the photo via text klim? You set me up! In this picture, she looks like the small-hands bubble-popping lady from SNL. First off, big congrats to Shannon for her epic 50 miler. That is a LONG way to go. Lindsey - that picture is fine, except for the fact you are wearing the number 13 RIGHT SIDE UP. Every good European cycling pro knows you put that junk upside down to "reverse the curse"!